Global Utility Income Fund Inc. The Duff & Phelps Global Utility Income Fund Inc. (NYSE: DPG) is a non-diversified, closed-end investment company initially offered to the public in July 2011. The Fund’s investment objective is to seek total return, resulting primarily from (i) a high level of current income, with an emphasis on providing tax-advantaged dividend income, and (ii) growth in current income, and secondarily from capital appreciation. The Fund seeks to achieve its investment objectives by investing primarily in equities of domestic and foreign utilities. The Fund’s investment strategies endeavor to take advantage of the income and growth characteristics, as well as historical performance, of equities in utility industries. DPG has outstanding bank loan to leverage the common stockholders’ investment. Under normal market conditions, the Fund will invest at least 80% of its total assets in dividend-paying equity securities of companies in the utility industry, which is defined to include the following sectors: electric, gas, water, telecommunications, and midstream energy. Under normal market conditions, the Fund will invest no more than 60% of its total assets in any one of those five sectors. No more than 20% of the Fund’s total assets will be invested in securities of midstream energy companies that are not regulated by a governmental agency. In addition, under normal circumstances, the Fund will invest no more than 10% of its total assets in securities of any single issuer. Under normal market conditions, the Fund will invest at least 80% of its total assets in issuers located in at least three countries, including the United States. The percentage of the Fund’s assets invested in issuers located outside the United States will vary over time, but under normal market conditions will constitute no less than 40% and no more than 75% of the Fund’s total assets. No more than 15% of the Fund’s total assets will be invested in issuers located in “emerging market” countries. The distributions listed in the table below reflect the amount of cash payment per share. A portion of the cash distribution represents return of capital. Any portion of the Fund’s distribution that is a return of capital does not necessarily reflect the Fund’s investment performance and should not be confused with “yield” or “income”. SEC 19(a) Shareholder Notices are available on this website on the page labeled “Reports & Notices”. Each 19(a) Shareholder Notice provides an estimate of the sources of each distribution based on U.S. generally accepted accounting principles which may differ from federal income tax regulations. On the webpage labeled “Tax Information”, we have posted the annual Tax Information Letter for each calendar year that informs shareholders of the sources of distributions for federal income tax purposes. Please note that the characterization of Fund distributions for federal income tax purposes is different from book accounting generally accepted accounting principles ("GAAP"). The amounts and sources of distributions reported in Section 19(a) notices of the 1940 Act are only estimates and are not being provided for tax reporting purposes. The actual amounts and sources of the amounts for tax reporting purposes will depend upon the Fund's investment experience during its fiscal year and may be subject to changes based on tax regulations. It is only after December 31 that we will know the exact source of our distributions. Shareholders should use only the Form 1099-DIV to determine the taxability of our distributions. These letters, showing the character of distributions paid by your Fund on its common stock and floating rate mandatory redeemable preferred shares ("MRP shares") for each calendar year, are sent to assist you and your tax professional in the preparation of your federal and state income tax returns. Each individual taxpayer should consult his or her own tax advisor for information related to your personal tax situation. Issuers of corporate securities are required to complete Internal Revenue Service Form 8937 to report organizational actions that affect the basis of securities. Examples of organizational actions that could affect basis are reorganizations, stock splits or nontaxable distributions. Proxy voting disclosure and guidelines for Duff & Phelps Global Utility Income Fund Inc. are available at the following third party web address. Search or browse voting activity by company name, ticker, or meeting date. MLPs: Investments in Master Limited Partnerships may be adversely impacted by tax law changes, regulation, or factors affecting underlying assets. Listed & Unlisted Options: The writing of listed and unlisted call options on equities held by a fund (covered call-writing) may involve certain costs and risks such as liquidity, market, management, counterparty, and the risk that a position could not be closed when most advantageous. 1Net Asset Value vs. Market Price: Net Asset Value (NAV) represents the total value of all assets held by the Fund (minus its total liabilities), divided by the total number of common shares outstanding. The net asset value returns reflect the performance of the manager. Market price is the price at which investors may purchase or sell shares of the Fund. Market price is determined in the open market by buyers and sellers, based on supply and demand. The Fund’s Market Price fluctuates throughout the day and may differ from its underlying NAV. Shares of the Fund may trade at a premium (higher than) or a discount (lower than) to NAV. This characteristic is a risk separate and distinct from the risk that the Fund’s net asset value could decline. The Fund has no control over the market price. 2Percentages based on total investments after written options rather than total net assets. The portfolio is actively managed and subject to change. 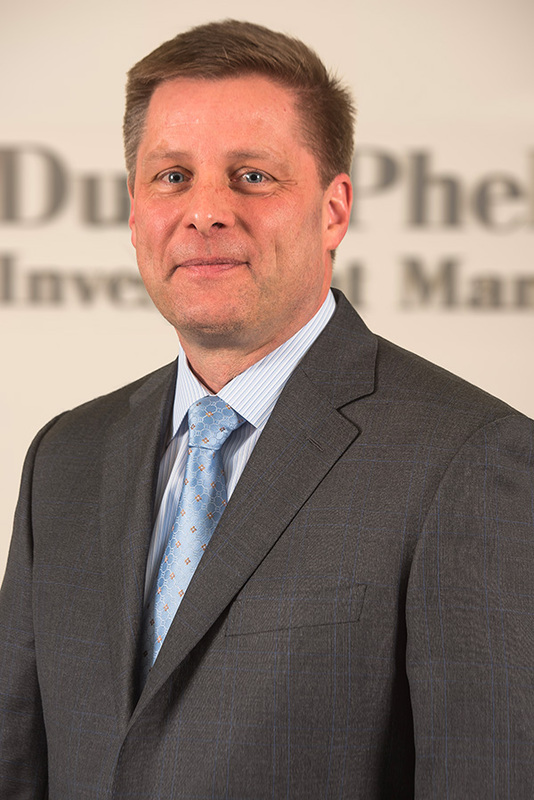 Eric Elvekrog, Senior Managing Director, serves as co-Portfolio Manager of the Duff & Phelps Global Utility Income Fund Inc. Mr. Elvekrog concentrates his research on the global telecommunications industry. He holds a BA degree from the University of Chicago and an MSA degree from DePaul University.